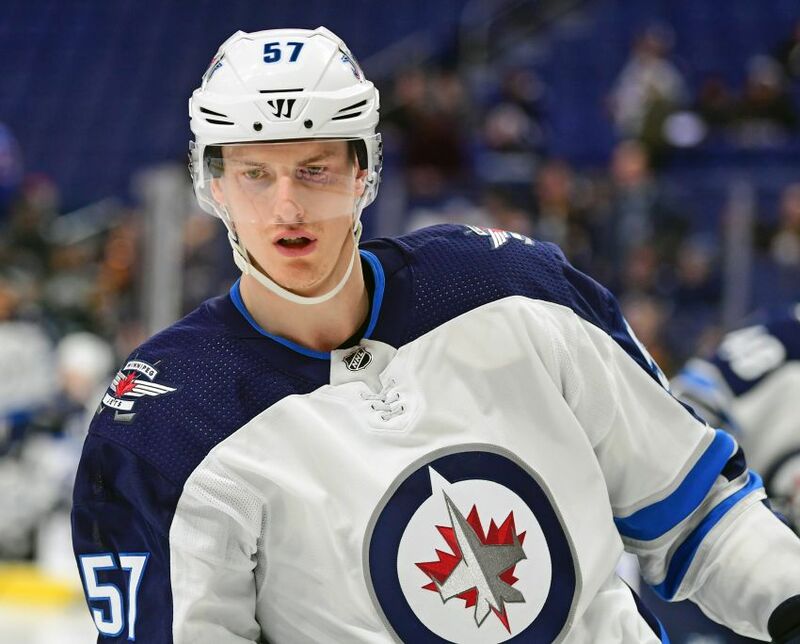 BUFFALO – In training camp, Winnipeg Jets coach Paul Maurice figured what the heck, why not throw defensemen Dmitry Kulikov and Tyler Myers, two of his biggest question marks, together? These days, the former Sabres form the upstart Jets’ strong No. 2 defense pair. But four months ago, no one knew what to expect from the 27-year-old veterans. Kulikov was coming off a miserable season in which a lower-back bruise he suffered in his debut limited him to 47 games. Meanwhile, groin and hip problems forced Myers out of all but 11 contests. “We put them together because they were kind of the two unknowns,” Maurice said prior to Tuesday’s 7-4 win against the Sabres. Kulikov and Myers, who played his first game as a visitor at KeyBank Center, have quietly morphed into two terrific comeback stories. Kulikov was supposed to play beside Rasmus Ristolainen in 2016-17, his only season with the Sabres. Instead, he moved around the lineup, even getting scratched as he battled his back injury and compiled a ghastly minus-26 rating. After arriving via a trade from Florida, the Russian never fit well in Buffalo. Still, his body of work with the Panthers was strong enough to earn him a three-year, $12.990 million contract from the Jets in free agency. Kulikov said he felt “as comfortable as I could be” a year ago. Through 41 appearances entering Tuesday, Kulikov had compiled as many goals (two) as last season while doubling his point total (10). His rating has also improved to plus-6. Myers, meanwhile, with five goals and 22 points through 43 contests, was on pace for his first 40-point season since his Calder Trophy campaign in 2009-10. At 25-11-7, the Jets are one of the NHL’s biggest surprises this season. Myers, the centerpiece of the blockbuster deal that brought defenseman Zach Bogosian and winger Evander Kane to Buffalo on Feb. 11, 2015, said Winnipeg feels like “home” now. Buffalo, however, will always hold a special place in Myers’ heart. Only seven Sabres in tonight’s lineup played with Myers, including winger Jason Pominville, who returned to Buffalo in June after five seasons in Minnesota. The Sabres made one lineup change, inserting rookie defenseman Brendan Guhle for veteran Josh Gorges. Defenseman Justin Falk and winger Benoit Pouliot were the other healthy scratches. Sabres defenseman Victor Antipin, out the last two weeks battling the flu, skated with his teammates Tuesday morning. Antipin looked noticeably thinner. “It’s got to be difficult, when you’re out that amount of time, just getting back into things, getting the timing down, getting some weight back on,” Housley said. Former Sabres goalie Martin Biron will be inducted into the Rochester Americans Hall of Fame prior to their Feb. 16 game against the Wilkes-Barre/Scranton Penguins, the team announced Tuesday. Biron played 103 games with the Amerks from 1997 to 2001, going 59-32-9 with a 2.36 goals-against average and a .921 save percentage. He also backstopped the Sabres’ AHL affiliate to the 1999 Calder Cup final. Notes: The Sabres assigned defenseman Taylor Fedun, who missed seven weeks with a lower-body injury, to the Amerks late last week. In his first games since mid-November, Fedun compiled zero points. … Goalie Linus Ullmark, recalled from Rochester on Monday to practice so starter Robin Lehner could rest, is still with the Sabres.